Read the header at the specified position in a DV file to build a video essence descriptor. Read the header at the specified position in a DV file to build an audio essence descriptor. 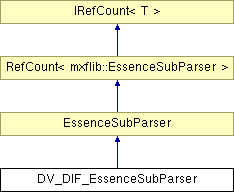 Read the header at the specified position in a DV-AVI file to build an essence descriptor. Read the header at the specified position in a DV-AVI file to build an audio essence descriptor. Read data from AVI wrapped essence. Byte offset of first byte of first DIF. Byte offset of last byte of last DIF + 1, or -1 if the file is an AVI file. Number of DIF sequences in a frame. True if this is a SMPTE 314M DV stream ("DV-Based"). The number of frames, if the essence is AVI wrapped. AVI Stream number, if the essence is AVI wrapped. The essence chunk FOURCC for this essence. The number of bytes remaining in the current LIST while essence parsing. The number of bytes remaining in the current #db chunk while essence parsing. Class that handles parsing of DV-DIf streams.